If you are looking for a long-distance hike which provides beautiful views, cultural heritage sites, and safety - I have good news for you! Via Algarviana is a fantastic destination, and I am happy to explain why. When I was looking for a winter getaway, I looked into opportunities in southern Europe. I do not like to hike in winter conditions, so I tend to look for places that do not have cold winter and enjoy early Spring. Two years ago, I went hiking the GR 5 trail in Catalonia. Last year - the E-4 path on Crete, Greece. Both choices proved challenging, diverse and beautiful. This year, I looked again toward southern Spain, possibly Italy, and Portugal. To narrow down my choices, I first decided to focus on Portugal. I had never been there before and had heard a lot about the beauty of this westernmost European country. I started to look into different regions of Portugal, taking its central and northern areas under my eye first. The most accessible entry port for me was Lisbon, so this decision was pretty natural. I hoped to hike in the Serra da Estrela region, but also worried it might be still too early to go there mid-February. These mountains are pretty tall (reaching almost 2000m) so it was out of the question to hike them in winter. I knew about the Fisherman's trail, as it caught my eye already a couple years ago. While reading more about it, I stumbled upon the Via Algarviana, and it proved to be the best choice. 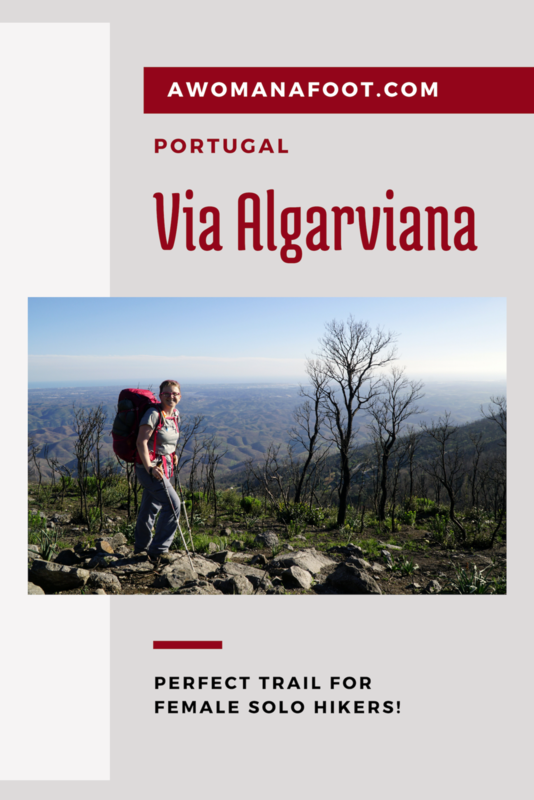 The Via Algarviana trail is a long-distance path stretching between the Eastern-most edge of southern Portugal, near the border with Spain, all the way to the Ocean on the other side. It crosses through the region of Algarve (hence the name) showing the interior side of this famous tourist destination. The trail is about 300 km long and is divided into 14 official sections. Unless one is used to making long distances in a day, it takes about 3 weeks to complete. If you have more time, you can combine it with many local paths or continue along the Western shore north from Cabo de São Vicente. It always starts and ends in a place with available accommodation. If you take your tent or bivy with you, you can have a bit more flexibility. But as I wrote, it’s not that easy to find suitable spots for wild camping on the trail. One of the factors in picking a trail for my winter trip was to find a trail with a non-technical path. During summer I hiked in Norway where it was hard for me to get into any kind of marching speed because of the technical difficulty of the trail. I had to continually move from boulder to boulder, over bigger and smaller rocks, climbing steep, uneven slopes or navigating snow patches. For this trip, I wanted an easy path that I could just walk on and enjoy the surrounding. I didn't mind steep walking - you can't avoid it if you like mountain views, just no problematic walking. Most of the Via Algarviana uses wide village tracks used by locals to reach isolated settlements. Some are very well made others somewhat forgotten and overgrown, yet hardly ever providing difficulties with walking. Only minor parts of the long trek were on narrow, tricky or technical paths. I really liked that I could just walk, letting my mind wander off, getting into a nice rhythm of walking. There is some road walking but it’s pretty limited, generally only in the towns we cross. Via Algarviana is perfect if you have mild mobility issues and need even surface to walk on. Only small parts of the trail lead over unstable rocks or narrow paths. You also don’t have to worry that the trail is too easy - unless you are a very advanced athlete. There is plenty of climbing and the constantly undulating path requires plenty of effort. Most days had at least 300 m of combined ascent, most were in the range of 400 - 550 m, with a number of days going above 800 m. Added to it the daily distances averaging around 20 km, I think it gives quite the workout! This provided enough to kick my muscles into hard work - I’ve lost over 4 kg of weight in that month which shows it was not just a simple walk. What do you see while walking Via Algarviana? In hiking, views are crucial to me. I enjoy the occasional hikes surrounded completely by thick growth, but I prefer open spaces and extensive views. Via Algarviana provides some forest walking, but most of it is through open spaces or near low growth and occasional trees. There are no alpine views whatsoever, but you will never get bored with the surroundings. There is rarely a truly flat land to walk on (except for the very end of the trail), and even the lowlands are filled with hills and low mountains. The trail gives a chance to see the inland Algarve - rarely seen by tourists who generally prefer to visit the beautiful coast. It takes one through tiny villages, many of which are partially depopulated and falling into disrepair. It crosses eucalyptus forest, orange groves, cork oak plantations, tarrases with pine trees, open fields of orange-red soil covered with low thorny bushes. Somewhere closer to the middle of the trail, the hiker enters bigger towns with lovely cafes and crosses more affluent neighborhoods. Still, the charming architecture and style of decorating houses don't differ all that much from what can be seen in the poor, depopulated hamlets. Colorful painted frames around windows and doors, painted tiles covering front walls of buildings, or concrete laundry washing basins can be seen all over Algarve. How difficult is it to find accommodation along the Via Algarviana? There is a reason why this trail is officially divided into 14 sections. It reflects precisely the ability to find a place for the night. For someone who relies solely on non-camping accommodation, it requires a rigid frame for daily walking distances. Sometimes it can be as little as 14 km, but there are a few days of 25+km, with one reaching almost 40 km. If that kind of distances are too much for you (as they are for me), you need to either grab a tent (or a bivvy) or be creative about using taxis or other forms of transportation. In some areas, there are buses which run between villages, but some places could be hard to navigate. For my trip, I took a small tent with me and used it five times. As the nights were still pretty cold, I stayed at available B&Bs more often than I initially planned. I went over my budget because of that. The average price for a night stay (sometimes with breakfast included) was about 35 €-40€. Hostels and shelters were around 15€. There was no campsite I could stay at, so I do not know what are the typical prices for pitching a tent. How easy is it to wild camp on the Via Algarviana? Initially, I hoped to wild camp more often - two nights to every one night at a hotel. Mostly I wanted to do it to save on the costs of the trip and not to be forced to walk farther than I wanted just to reach accommodation. I wanted to stay at hotels or hostels every now or then to have a chance to take a proper shower and do laundry. But during the journey, wild camping proved much more difficult than I thought it would be. First of all, the nights were colder than I expected. Portugal seems to be more humid than its neighbor, and even though the temperatures never dropped close to freezing, it felt much colder than it really was. When you add breeze to the moist cold air, you are freezing. I took my light summer sleeping bag with me, and it was a mistake. In Catalonia, I had a winter bag, and on Crete, it must have been warmer because I don't remember being that cold! Another problem was finding a place for the tent. On the days when I wanted or needed to camp, I had a tough time finding even a small spot that would be somewhat flat and even. As I wrote earlier on, the land is continuously undulating, sometimes there are only slopes around you. And although there are a lot of terraces built into the hillsides, they are narrow and mostly completely covered with compacted soil furrows and rocks. The additional problem was the dry and thorny plants. I had to move my tent once when I realized the prickly thistles made holes in the floor. Finding a hidden spot was also tricky if you hoped to see something near a town as the farms and farmland stretch sometimes for miles around a city. The water might be a problem - I was always looking at a map for possible wild camping spots that would be not too far from a water source, but after learning the land a bit more I knew it was pointless. You just have to take as much water as you need where you find it - and then find a place. They rarely went together! Also, what I saw on the map as a stream, in reality, was an unreachable jungle-like growth and sometimes I had to walk for a long time to find a way to actually reach the water without cutting down 3m-high reeds and thorny bushes. The soil is generally very, very rocky everywhere. Sometimes there was absolutely no chance for a night sleep even for a bivy - unless one wanted to sleep directly on the road. How hard is it to navigate Via Algarviana? You need only basic navigational skills to hike this trail. Most of the time, the path is very well marked with white and red stripes as well as dedicated plaques and signposts. There were only a few places where I lost my way or had to think about the direction. Part of it was because of the wildfires which damaged some of the signage. Some were because of how similar some crossing tracks were to each other, which meant it was easy to overlook a turn. It was enough to quickly look at the ViewRanger go correct the path, though. I downloaded the GPS data from the official website and uploaded it into the ViewRanger. I had the official guide in pdf on my kindle as well as the detailed guide by Harri Roberts . I didn't have a paper map for this hike which I usually advise against. But this time it really wasn't needed. If you are a beginner in the world of orienteering or if your mind struggles with learning maps, this trails is perfect. How dangerous is it to hike Via Algarviana solo? It isn't. Really. I am saying it as a scaredy cat with severe anxiety. In my case, my more significant fears come from people - I'm always anxious when I get close to a village or people on the path. For the whole month, I was in Portugal, I didn't meet even one negative person. I don't know what's in their water, but the people were the most positive, charming, helpful, and lovely folks I had a chance of meeting. With every day I was less and less anxious about walking through villages because I knew the people I’d meet there would be smiling, waving to me, and showing me the path. I never saw any weird or creepy gesture or movement. On my trip, I met a few hikers. A few couples on short day hikes or max 3-day hikes near towns (all looked like retirees), one solo man on a day hike and three solo women doing the whole length of the trail! I guess more women find this trail perfect for a solo adventure! One of the ladies I met was traveling with two donkeys! That was a first for me. Concerning natural dangers, I haven't found any. I enjoyed pretty good weather, with only some rains in the beginning and the end. I had no thunderstorms which might be scary in the open fields. Even when it was raining heavily, there were no flash floods, and crossing streams was not a problem, although I had to take my boots once and wade barefoot. There are no dangerous animals, I saw a pair of deer once (very exciting), and that's about it. There were bees and wasps - so if you are allergic, it's worth taking precautions. The village dogs were almost always behind fences or chained. When is the best time to hike Via Algarviana? My choice to start hiking mid-February was simply perfect. I could enjoy moderate temperatures perfect for hiking. As you can see in the photos, I hiked quite often in just a t-shirt and some days I felt too hot! When it was raining or overcast it could be slightly colder but never cold enough to hike in a jacket. Sometimes in the morning I started with a fleece on but after a while I had to take it off. But the best really weren’t the lovely temperatures but the Spring all around me. I could enjoy stunning wild flowers with bees buzzing around them, blossoming fruit trees and fresh oranges. The birds were making crazy noise all around me and the air was filled with sweet smells of flowers, citruses, and soil. Many of my breaks were filled with taking photos of the blooming nature or bees. I soaked all the sunshine and a few times forgot to reapply sunscreen, so pretty soon got a tan. Some days I felt like it was middle of the summer not late winter! Another good reason to go so early in the season, is for the lack of tourists. Although Lisbon was already filled with them, all the other towns and popular tourist destinations were blissfully crowds-free. I love hiking solo and crave the solitude, so the empty paths and trails were just what my soul needed. Summer is a popular time to visit Portugal but is not suitable for hiking. The temperatures often go above 35°C and hiking in such conditions can be dangerous. As I already wrote, much of the trail is exposed and sometimes you have no shade for hours or even days. I can’t even imagine doing any physical activity at such hot weather! Fall is another great season to go hiking - instead of blooming nature you can enjoy the changing colors of foliage. What’s there to see beyond the Nature? Via Algarviana crosses many tiny villages and settlements as well as a few bigger and smaller towns. Some of them are perfect for a day off. There are bus services in the bigger towns so you could use your day off to do a day trip. I did that in Silves and went for a day hike to the Ocean, to see Portimão and Ferragudo - it was a great idea! Some of the villages we pass are truly tiny, just a few houses along one road. The settlements in the eastern part of Algarve were sadly depopulated and often had just a few handfuls of inhabitants, often all 50+. I absolutely loved the whitewashed walls adored with colorful frames around the windows. Some houses were painted in vibrant colors and some - covered with the traditional tiles. Many houses had garden ovens, so there was no need to bake indoors in the heat of the summer. The towns looked very similar to villages in terms of the style of buildings, but usually had a church in a prominent spot, a net of narrow streets (often cobbled), and at least one restaurant with delicious coffee. Via Algarviana goes through such towns, as Alcoutim (the official start of the trail), Vaqueiros, Cachopo, Salir, Alte, Messines, Silves, Monchique, Marmelete, Bensafrim, and Vila do Bispo. From some of them it’s pretty easy to also go and see Lagos, Sagres or Portimão. There are local trails (marked with yellow and red markers) that can lead a hiker to other great locations in the area. Via Algarviana - any downsides? It’s hard for me to find any, really. The hardships with wild camping would be one, that’s for sure. I wished there were more modest hiking shelters/hostels or campsites on the way. Many of the available accommodation choices were luxury B&Bs, way beyond my typical budget (and a reason why my went through the roof). There were a few hostels and shelters on the way but not enough. I hope the people behind this fantastic trail will look into the needs of less affluent trekkers. In one area around the village of Casas Baixas, two old schools were transformed into bunk house shelters and I think this is just the perfect idea. If you are coming from the US or UK, the prices might seem fantastic, though, a lot depends on where we come from. Another possible difficulty could be a language barrier. I do not speak any Portuguese and in many places (including accommodation) I couldn’t communicate easily. English was not well known, especially among the older generations. What’s interesting, German was a much popular foreign language options. I didn’t really mind, most of the time it was enough to use some hand waving gesturing, single words in English and German to get what I needed. I’ve learned the basics of greeting people and “thank you”. I rarely needed more as I didn’t feel the need to actually talk to people (anxiety and introversion speaking here). The Via Algarviana begins in Alcoutim at the very border with Spain. The nearest airport is in Faro, but I actually chose to flight into Lisbon. It was easier to get direct flight there and then jump into a train south. I spent two days exploring the capital, then moved to Faro where I again spent a day site seeing the charming town. From Faro I took a local train to Via Real de Santo Antonio. I spent a few hours walking around the sleepy town and finally went by bus to Alcoutim. I spent the night in a hostel which is located above the town, on the trail. It’s the perfect spot to stay, although you might miss the official start of the trail by about 100 m or so if you turn left from the bus stop into the road leading to the hostel. When I came there it was already dark and the next day I didn’t feel like going down the road and then climbing back again just to see the marker. I’m no thru-hiking purist! The end of the trail is at The End of the World (as it was known in the middle ages). There is only a lighthouse and a restaurant there. After walking around and taking commemorative photos, you need to get to Sagres. There is a bus once a day (3:05 pm) and if you miss it - a 6 km walk. It’s absolutely doable to catch the bus - I walked from Vila de Bispo in a normal tempo and got to the lighthouse with enough time to get a congratulatory cup of galão (tall coffee with milk). Say 'thanks for the read!' with a cup of coffee! Soon, I will get into detailed reporting on each section of the trail. Come back soon to learn more about this fantastic trail! 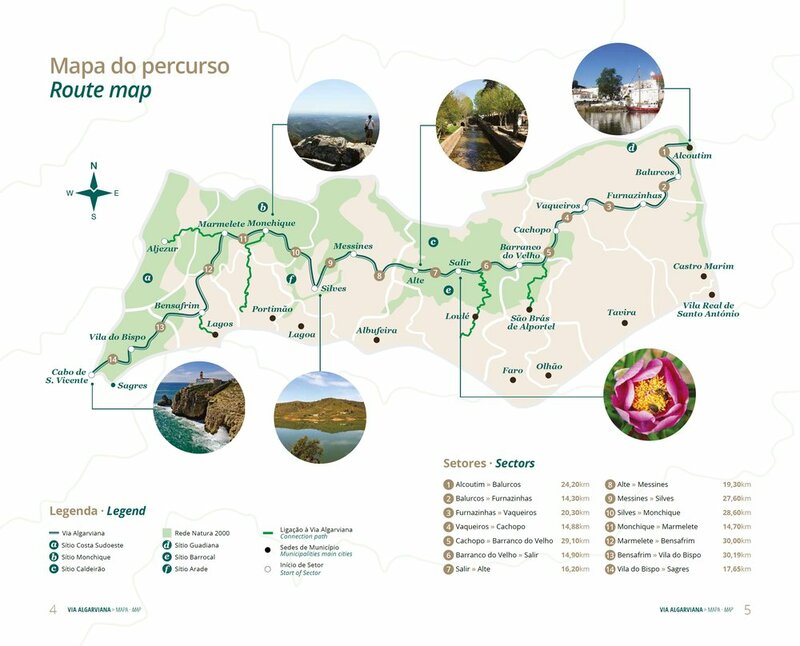 Have you hiked in Algarve? Did you like it? What are you favorite long-distance trails in Europe? Do you have any questions about hiking Via Algarviana? A good hiking jacket is always a good idea (especially when on sale)! Pin it for later and share with friends!